PACOIMA — The San Fernando Valley JACL will screen “Under the Blood Red Sun” (2014) on Sunday, March 12, at 2 p.m. at the San Fernando Valley Japanese American Community Center, 12953 Branford St. in Pacoima. Set in Hawaii, the story focuses on 13-year-old Tomikazu “Tomi” Nakaji (Kyler Ki Sakamoto), whose life is turned upside down by the Japanese attack on Pearl Harbor. 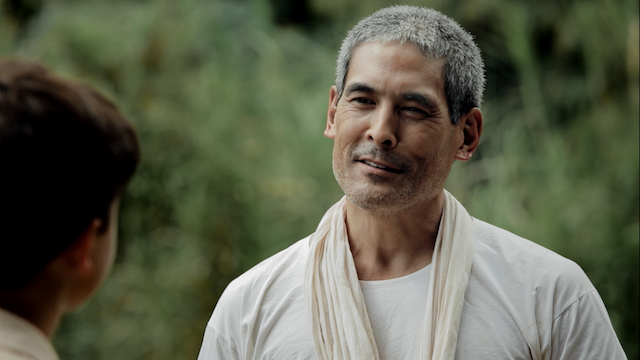 His father (Chris Tashima) and grandfather (Dann Seki) are arrested and his mother (Autumn Ogawa) loses her job. To make matters worse, the son of the wealthy Caucasian family that employs and houses Tomi’s family relentlessly bullies him. With help from his best friend Billy (Kalama Epstein), Tomi overcomes fear and prejudice to become the man of the family. Directed by Tim Savage and adapted for the screen by Graham Salisbury from his novel, the film also stars Wil Kahele, Bryce Moore, Mina Kohara, and Benen Weir. Tomi (Tyler Ki Sakamoto) and his mother (Autumn Ogawa). “Under the Blood Red Sun” has won awards at the Big Island Film Festival, DisOrient Asian American Film Festival, International Family Film Festival, and San Diego International Kids Film Festival.